Whether you're a professional or one who simply paints for pleasure, choosing the right tools for the job is critical. 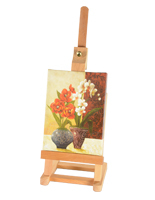 Artist easels not only provide the look, they also perform the important task of securing your canvas. 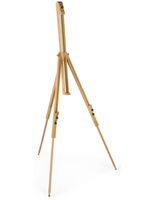 Displays2go stocks floor standing tripods as well as smaller versions like pochade boxes for countertop use. 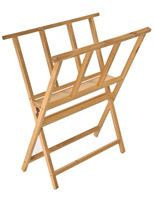 Some wooden artist easels with trays can support frames well over six feet in height! In addition to our collection of studio stands, we also sell print racks, drawers, and cases for all your art supply needs. 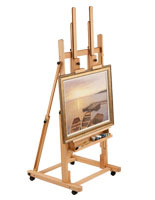 Artist easels for canvases play a vital role by enhancing creativity and inspiration. The best part of all? Our prices won't gouge your wallet. 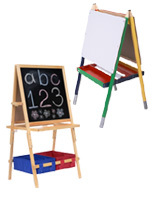 What styles of wooden display stands are available? 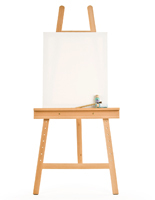 Studio easels are workhorses designed for everyday use. These models support the largest canvases and feature a wide range of adjustability. 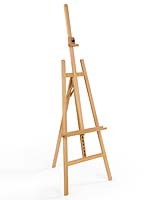 Raise or lower your canvas to a comfortable working height. Adjust the tilt to avoid glare from overhead lighting. Storage trays help keep brushes and palette knives within easy reach. 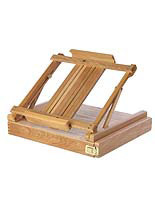 Select styles even come with rolling casters if easy mobility is desired. 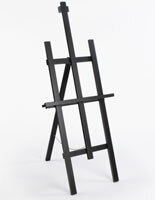 French easels are icons in the annals of art history. Dating back to the mid-19th century, these portable stands made it easier for artists to paint "plein air", or outdoors. Working in natural light provided Impressionists with various lighting conditions not possible inside the studio. 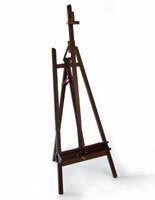 Since the painter had to carry their easel to the site, a new type of tripod was invented. The entire stand collapses down to the size of a storage box which can be carried like a modern backpack. 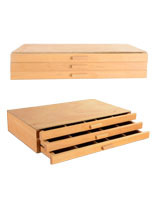 Pochade boxes offer compact designs with plenty of storage for art supplies. The main difference between these and the French styles is they have no legs. Intended for table or countertop use, sketch boxes can also be taken with you and used outdoors. Canvas size, however, is limited. 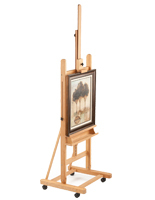 The one feature these fine art easels share in common is solid, hardwood construction. 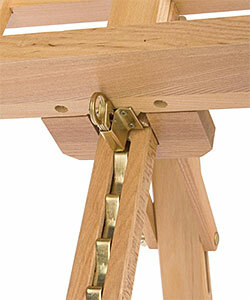 Our stands are manufactured with either oak, elm, or beech wood with clear, lacquered finishes or black paint. 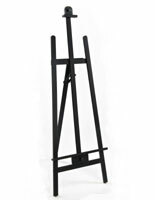 Since their main function is to clamp a canvas for painting, top and bottom support bars anchor the frame securely to the tripod. Models with storage drawers or trays further increase the convenience of having your supplies close at hand. 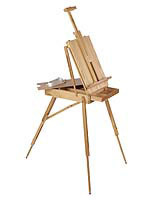 Whether you're working in oil, acrylic, watercolor, pencil, charcoal, or pastel, an easel stand is an essential part of the artistic experience. Over time, they will get covered with drips, sprays, and splatters. 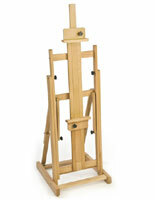 After your painting is completed, displaying a finished piece on a tripod is sometimes warranted. In this case you might choose not to use the stand covered in paint for that purpose. 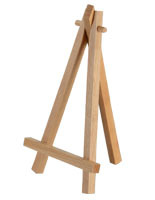 A simple yet decorative wooden easel stand designed for gallery or exhibition would offer a clean and professional presentation for your canvas!